AMY GOODMAN: The documentary The Amazon Awakens, an excerpt, that was made by Walt Disney but commissioned by the US Coordinator of Inter-American Affairs. Greg Grandin, author of Fordlandia, Walt Disney—he visited? GREG GRANDIN: Yes, he visited prior to making this documentary. They were friends, Henry Ford and Walt Disney. And there was even evidence that some of the attractions in Disneyland in California were actually based on experience in Fordlandia, the Tropical Belle steamship ride or riverboat ride. ...GREG GRANDIN: Well, you know, let me say that, you know, Ford spent about a billion dollars, in inflation-adjusted dollars, on this project, and not one drop of latex made it into a Ford car. It was an absolute failure. And the more it failed, the more—this is also a resonance with recent history—the more it failed, the more he justified it in idealistic terms, not unlike, in some ways, the Iraq war. The more you fail to find weapons of mass destruction, the more it becomes a civilizational mission to bring democracy to the Middle East. The same thing with Fordlandia. There were riots, and there were—workers rebelled against this attempt to impose Ford-style regimentation. One worker called it resisting being turned into 365-day machines. And then, of course, the environmental aspect of it. 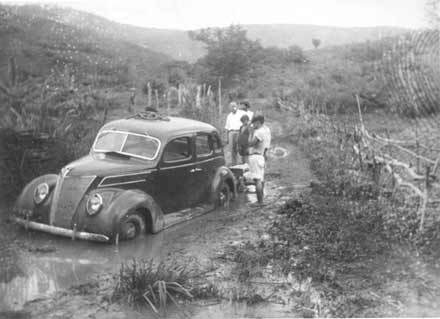 Ford basically—by planting rubber trees so close together in the Amazon, Ford basically created a large incubator. Caterpillars and pests and blight just devastated the plantation. The more it failed, the more money that was poured into it. AMY GOODMAN: And the people who were in the Amazon, the response there, the natives of the Brazilian Amazon? GREG GRANDIN: Well, they did resist that heavy attempt to regulate every aspect of their lives, not just the industrial regime, but also their diet, their sanitation and medical regulation. And during one riot in particular, they smashed all the time clocks. This was a particularly symbolic rebellion against Midwestern industrialization. ...And Fordlandia, in some ways, is very resonant with this. Just, you know—you go to Fordlandia, and there’s almost a yearning for this kind of holistic capitalism, a kind of paternal capitalism or developmentalism, where capital—where industries cared about what happened to workers, in terms of education, in terms of healthcare. But you go 300 miles east of Fordlandia, and there’s this city of Manaus, which is the fastest-growing city in Brazil. It’s a free trade port in the middle of the Amazon. It kind of sprawls out like some kind of perverse Oz eating away at the jungle. And nearly every major electronics corporation—Nokia, Sony, Sanyo, Harley-Davidson and other—Honda—have assembly plants there, where they make—where they assemble brand-name products for sale elsewhere in Latin America. So it’s a perfect example of how Fordism has been extended globally. So you have this nice two contrasts, Fordlandia and Manaus, side by side.